The variety of soap making oils available today is literally mind boggling! Deciding what types of oils to add to your soap making supplies inventory can be a very difficult task. Before you even start, you need to decide what it is you want from your soap. Do you like soap that has a big bubbly lather? Perhaps you prefer your soap to have a thick and creamy lather. Or maybe lather means nothing to you and you're more concerned with making a soap that is super gentle for sensitive skin. Once you've decided what you want from your soap, you can start to pick out the soap making oils that will achieve the effect you are looking for. I've included a good sized list of oils below that are used in soap making. Each link contains information about the oil and about the qualities it will bring to your soap recipe. You've decided what you want your soap to be like, you've researched the oils and picked some to use, but now you're stuck. How the heck are you supposed to figure out how to put it all together? It's actually not that difficult. When I'm creating a new recipe, I start with my Basic Homemade Soap recipe which contains 30% Coconut Oil, 40% Olive Oil and 30% Palm Oil. Depending on the type of soap I want to make, I'll replace some or all of one or more soap making oils with other oils that have similar soap making qualities. For example...say I want to make my recipe palm free. To do that I would replace the palm oil with oils that perform similarly in the final soap. Oils like shea butter and cocoa butter are prime examples. Same goes for tallow or lard. Perhaps I want the soap to be less cleansing and more moisturising. In that case I would remove some of the coconut oil and replace it with an oil that has moisturising qualities like avocado oil. One thing to remember. If you change an oil in a soap making recipe, you must always run the recipe through a lye calculator to calculate the new amount of sodium hydroxide that will be needed. Check out the tables below. Each group contains soap making oils that share the same general soap making qualities. While most oils will preform many functions, I have listed them by the ones that I feel they are best at. These three soap making oils are wonderful. They are the ones that provide the big fluffy bubbles, give cleansing action and make your soaps nice and solid. Remember to try to keep their combined totals to no more than 30% or the soap may become too cleansing and result in dry skin. If you do decide to make a soap that contains a large percentage of coconut oil be sure to increase the amount of free oils (superfat) in order to counteract any possible drying effects. This next set of oils will give your soaps their conditioning ability. Each oil has its own unique skin care qualities that you can utilize to create personalized soaps. These oils usually make up 40% - 60% of one of my recipes. Castor oil is in a league of its own. This soap making oil not only conditions but provides a fluffy and creamy lather. One drawback with this oil....it produces a very soft bar. Good thing a little goes a long way. 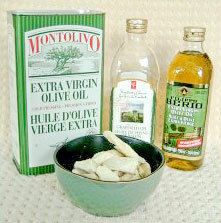 When I use this oil, I only replace a small amount (5% - 10%) of the Olive oil and the soap bar will still be firm. The one exception being in a shampoo bar where I will use up to 20% Castor Oil. This next set of soap making oils is used to lend further strength to the soap bar, increase the conditioning ability and stabilize the lather. Not up to creating your own recipes yet? No problem...visit my Soap Recipes, Basic Soap Recipes and Palm Free Soap Recipes pages for a great selection of recipes ready to use.